Southern Californians are among the small percentage of folks across the country who will see their outdoor living habits hardly change at all with the changing of the seasons. We can keep right on grilling every weekend, comfortably sip wine on the patio with our friends late into the night and – for many of us – we won’t even have to rake any leaves. While this does mean that we largely miss out on the natural beauty of leaves changing colors on masses of trees, the trade off is that we need to do little more than put on a light sweater to continue enjoying our outdoor living areas throughout autumn. Of course, the coming of fall does bring a few changes, such as the sun setting earlier and rising later and the fact that, once the kids are back in school, any weekday outdoor grilling will likely happen a bit later in the day. 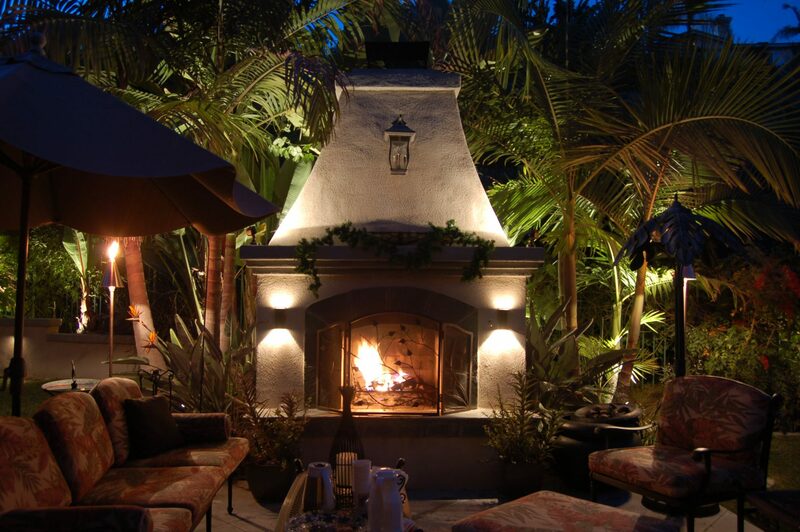 Since fall evenings tend to be a bit cooler than summer evenings, you will likely also find more occasions to enjoy your outdoor fire features, such as fire pits or patio fireplaces. To help prepare your home for these changes that come with the changing of the seasons, here are 10 tips for getting your outdoor lighting ready for fall. 1. Light your fire features. Since you will likely be using your fire features more often once fall weather arrives, now is a great time to adjust outdoor lighting to ensure that the area around your fire pit or other fire feature is appropriately lit. This probably will not mean installing bright floodlights with wide beam spreads that would take away from the intimate ambiance of a patio fireplace or fire pit. It is far more likely that you will want soft lighting that provides just enough illumination to help your guests safely find their way to their seats. 2. 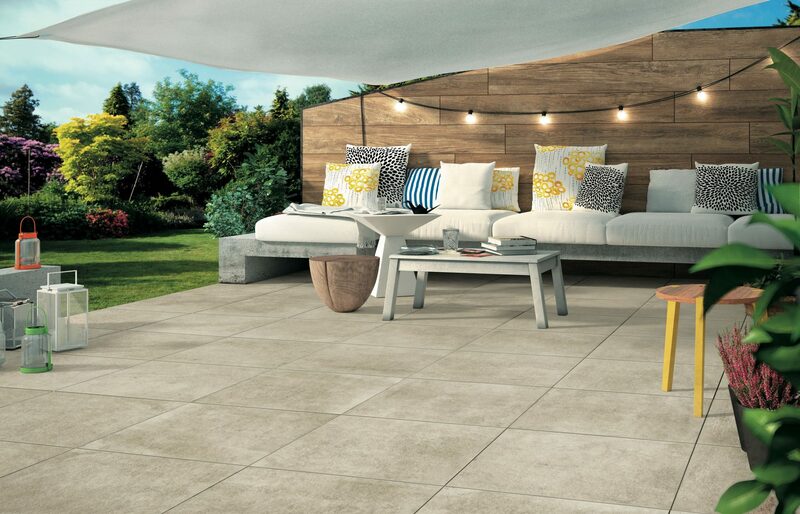 Bring warmth to outdoor areas. While it can still be quite warm in fall, evenings can get chilly. 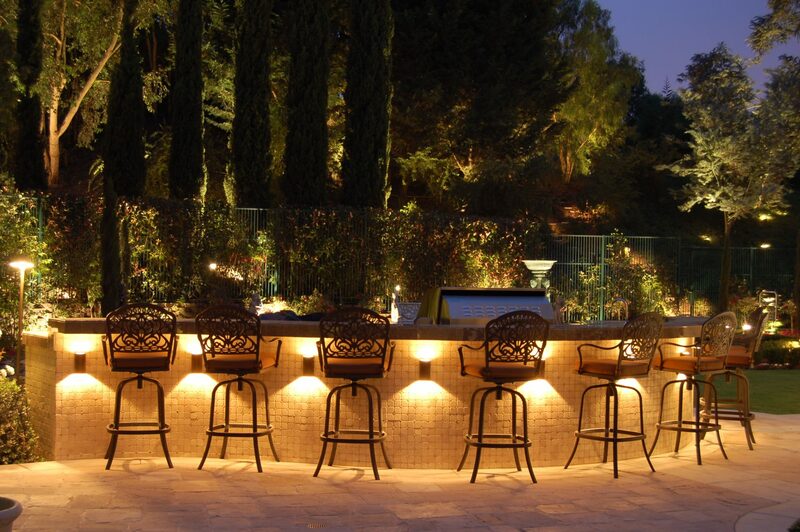 Create a warm, welcoming environment in your outdoor entertaining areas by adding uplights, downlights or sconces that provide just the right amount of light to warm up the space. Work with an outdoor lighting designer to use landscape lighting to help create the perfect space for fall entertaining. 3. Regularly remove branches and leaves. Leaves and small branches are more likely to fall in autumn, which means they are more likely to obscure your light fixture’s beams, block your lenses or, in some cases, even become a potential fire hazard. During the fall, it is even more important that you regularly remove fallen branches and dead leaves to avoid these issues. 4. Adjust uplights on deciduous trees. While we are the topic of fallen leaves and branches, it is a good time to address any bare branches you might have in fall and winter. Although you may love the way your outdoor lighting perfectly illuminates the deep purple leaves of your plum tree throughout the spring and summer, that same lighting might make your plum tree look a lot less beautiful and accentuate the starkness – or even look a bit creepy – once it loses its leaves in the fall. Consider adjusting lights on trees if branches are bare if your yard begins to look like a scene from a horror film. In most cases, you can simply lower the angle of the light to still show off the trunk without putting as much emphasis on the bare branches. Of course, if you are planning a Halloween party, you may want to adjust your uplights to show off those bare branches even more to create a scarier atmosphere for your soiree. 5. Add lights to guide traffic. Speaking of Halloween, if you live in a neighborhood that gets trick or treaters, you may want to consider adding pathway lights to direct traffic from the sidewalk to your front door. This can help keep kids off of your lawn and out of flowerbeds. 6. Supplement with string lights. If you plan on doing a lot of fall entertaining, or at least having folks over for Halloween or Thanksgiving, consider supplementing your current outdoor lighting design with some festive string lights to add soft lighting under umbrellas and canopies or strung between the eaves or your house and your covered patio. If you have an older outdoor lighting system and are still using halogen bulbs, now is a good time to consider switching to LEDs. While LED fixtures have a higher upfront cost, they last significantly longer and can help you lower your monthly utility bills. 8. 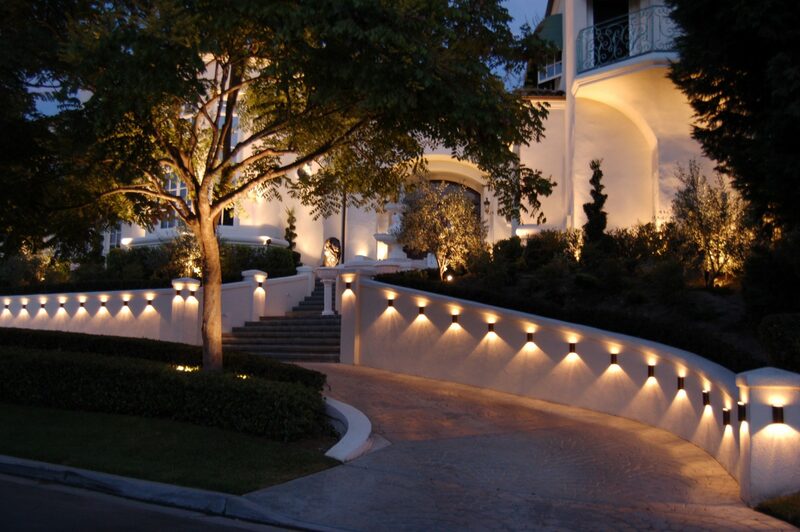 Consider supplementing your solar landscape lighting system. Solar outdoor lighting allows you to light your outdoor living areas without increasing your electricity usage and can be placed almost anywhere, since there is no wiring about which to worry. However, shorter days mean less sun to power your lights and that your lights will be turning on earlier, so you may find that you and your guests are in the dark long before the party ends. If you plan on doing a lot of fall entertaining in the evening, you may want to supplement your solar lights with string lights or wired landscape lighting that you know can rely on. At the very least, you will need to come up with a backup plan for those nights when your party lasts longer than your solar lights. 9. Adjust your landscape lighting timer. Most timers for outdoor lighting automatically turn your lights on at dusk, and then turn them off after a predetermined number of hours. Talk to your installer to make sure that you have this type of timer. If not, adjust your timer to turn on earlier in the evening to avoid your guests showing up at a dark house as the days get shorter. If you leave for work early in the morning, you may also need to adjust your timer to take this into account. If you do not have a landscape lighting timer, now is the perfect time to install one, particularly since it may still be dark when you leave for work and be dark when you get home as the days get shorter. 10. Perform routine maintenance tasks. 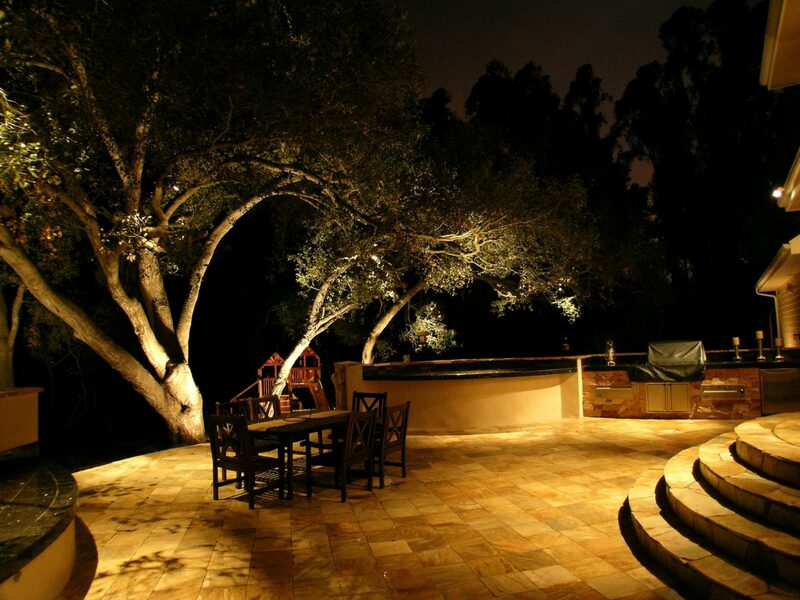 As you prepare your outdoor living areas for the coming season, it is a good idea to include performing routine outdoor lighting maintenance tasks on your to-do list. Making this part of your seasonal chore list will make it easier to remember, which is important, since regular maintenance helps to ensure proper function and can extend the life of your outdoor lighting system.